drwxr-xr-x + 6 root wheel 204 7 Oct 23:36.
drwxr-xr-x + 28 952 December 15 root wheel 00:15. My conclusion therefore is that the property of directories is bad at least to/var/folders. On other threads I read that with permissions of El Capitan files where protected, and once upgraded to El Capitan they should be corrected and impossible to change. I tried to reinstall the El Capitan 10.11.2 update by downloading the file from the web site, did not help to repair permissions, as described above. Is there a way to change the ownership and authorization to the rule of law in El Capitan? Some things are protected, not all. All subfolders of zz should belong to different 'users', no root. The only ones that are correct in your list are the first two and that held by softwareupdate. The only way I know to fix would be to use chown in the Terminal to set the appropriate for each user and group. Why firefox free version 29.0.1. It's terrible! I had to find a plugin to change the back legs. Bad decision. Why this was done? Not happy with the version 29.0.1 - are there plans for this move? You can provide more information such as your operating system and installed extensions and plugins installed. In case of accidents also please add a few recent crash ID that you can find on the subject: page hangs and which begin with a prefix 'bp '. You can check for problems with the files that store the preferences. Delete a possible user.js file and files numbered prefs-# .js and rename (or delete) the file prefs.js to reset all the prefs by default, including the prefs set via user.js and pref which is no longer supported in the current version of Firefox. Can I programmatically change the default property to create for all elements of the front panel? I need to make the logout button, when click on, takes care of all the default values of my fron Panel. There is no way to programmatically call the functionality of an editor 'Use default' or 'Load Default'. To do it yourself, you will need to write your default values for each control explicitly in the diagram, when the user press the logout button. Insofar that I tested it, the nodes of property Value (and value (signalling)) do not work under MacOS: value property is a Boolean value, the value (signaling) as a cluster (width, height). Even with the Boolean controls, the node does not work. Not such a problem in LV 8.6. Am I missing something? Is that some 'of use' ? Or just a bug? This looks like some sort of problem of indexing with the nodes property as somesort of corrupted installation. What happens if you just delete the property node and recreate him? I filed a digital control and looked at the context menu of the list of the nodes property. 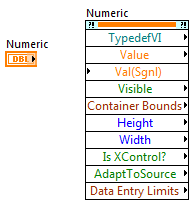 Below value and value (signs) are Visible (which would be a Boolean value) and Xcontrol, that when you bring through the submenus, the first choice is container bounds, a cluster of Width and Height. If these 2 types of data which are located 2 below in the list match those you found. What happens if you take another node in property a few elements upwards or downwards in the context menu? Fact is happen for other properties, and if so, are thereany properties who agree? Here's what look like my property for a digital nodes and I draggged the box up and down to show the natural order of the nodes property. Notice that I have script installed, so there are a few other nodes property (and the blue box at the top) you may not have. PS. Verify you the signature. Kudos button is now moved to the left since the update of the forum. How can I recover the propertyeditorsource the separator character used to represent strings for the PointSize property? I use the buttons / switches mechanical locking action, event structures and local variables to track the status of my switches. I used local variables with indicators, too. Now I see that this could be done via the node property of a switch or an indicator. Should I use the nodes property instead of local variables? Should I use "switch" mechanical action and control the State of the control buttons / switches? I used a mechanical locking action because it automatically reset when it is read, but who pushed me in the use of local variables. I know the property values to adapt the data flow model, while local variables might be placed in a sequence structure to ensure the order of execution. I just don't want my program all except if it is a correct approach. Well, I'm changing the properties of user interface in my state machine. For example, when you push a button to START the TEST, I want to disable and gray this button and activate the button to STOP the TEST. Another example... I have a couple of dozens of LEDs on the front panel to show the TEST SUCCEEDED. If I have the wiring all of them, my state machine diagram gets messy. Define disorder! In my mind, code is not held together by wire is much messier because it is impossible to determine the order of execution and so program logic. A thread is a small 1 d object. A property node is a significant 2D object. 20 wires are much less messy than 20 knots of property, especially given that each property nodes still hanging by a thread in one way or another! In order to reduce the number of threads, use the most appropriate data structures. Instead of a few dozen sighted use a single Bay of LED. A single wire! Keep the table in a shift register and update alone LED as necessary by using "replace subset of the table". I have a riddle. I created a task programmatically in LabVIEW and programmatically added several analog input channels to the task. It's easy. I wish that my user must be able to modify the individual channels within the task. To this end, I created a set of screws that allow it to change the settings appropriate to the channel (for example, if it is a channel of thermocouple, it can change the type of thermocouple, CRC value, etc... If it is a strain gauge channel, it can change the coefficient of fish and so on). These screws all works beautifully, like the VI where they live. Note that immediately after setting the property nodes, I read their values back, just to see what comes out back. What I am doing wrong? I fought this for a few days now and I'm stumped. Hi, Diane. A week ago, I also had a problem changing the channel properties (not sure that our situtions are exactly comparable, but...). My 'solution' to want to change the appearance of the task was to just throw the original task and recreate all the elements of the task from scratch. I'm new to LabVIEW. IAM trying to display two plots on a graph using the node property value charts. I tried to feed the two signals into a signal of fusion and then in the value property node, but it did not work. Then I tried to build a table of two signals and it powers the value of hardware node. It did not work. What escapes me, should I use the node property value this way? I know that you should keep the use of local variables to a minimum in order to avoid race conditions. Is this the same problem if you using the eg property node. a digital control? Basically to make the scheme simple and enjoyable to watch. Exactly. Perhaps, he creates the race conditions and should not be used. Using wires to connect the terminals is the approach only "Save". I'm building a VI that returns a list of all the side screws and their auxiliary screws, etc., a given top-level VI. I first open a reference giving the path to the top-level VI, and then use the property 'Called' to get the subVIs. I then (in a loop) get all each Subvi conscripts by opening a reference using the name of the previous output called string. I noticed something when I ask for conscripts by the string name of XYZ.vi, that I get all its subvis, but I also have a XYZ.vi:Instance:0 name returned. What is the purpose of the proceeding: 0 and why is it happening? I like understand why Instance: x would never get added to the name, and also why VI would return his name in the property called? The VI is not defined as re-enterent or calling themselves dynamically or anything like that. Hope someone can explain that. Hello and I hope that your well today. I continued to study your issue now I am back in the office, with my LabVIEW machine and resources OR. I concluded and also since found a confirmation of this issue. For a first level VI which has a few express screws on its block diagram, the names of the callee property currently includes a single instance of the upper level for each express VI VI. For example, if a VI has two ExpressVIs in the block diagram. The property called node will return two instances of the toplevel VI. The problem is if you use VI server that this name is not valid - and causes a VI Server error. So I think it would be pretty safe filter these names. I have an intermittent error disabled 1077 on changing the value of a series of nodes of Boolean property in my program. I'm passing an array of references in a loop For, all the controls are in this VI and it can be classified for these purposes as a first level VI. Most of the time that my code works fine, however, debugging my code this morning after any recent change in this part of the code I get errors that I have problems. Any ideas on how to get this past or what is causing it please? Photo of part of the attached fault code. (Loop on the right is normally recorded shirft, but is not currently facilitate debugging). Because my table of numeric values was so small in width, I saw only a figure because I expect only the width to a figure. In one of the structures of the event, I wrote the number 030 instead of 0 for the node property disable result with the above error. I learned from this mistake and my paintings a little wider. (This is a similar problem when you forget to look for the possible extra line in a control of the chain). When I click on something, I have a little box in the middle of my screen saying that the program has a bad image. Also, every time I turn on my laptop, after & his signature while in I get loads of boxes for loads of programs that got my cell phone. Please help me, I did something different, and I've never had this before. I don't know what to do and its slowing down the process of fill me my work right down. Warning: After you used the clean boot in order to solve your problem follow step 7 to reset the computer to start as usual. Sorry if this is already covered somewhere. I currently have an application with a list view in my main.qml. I put a context property for my class app c ++ to be "app" in my main.qml. My list uses a custom list item that is defined in a file separate qml. The custom list item has a popup menu. In this context menu, I want to call Q_INVOKABLE functions that are part of my class from the main application in C++. What is the best way to be able to do? Should I just set the context property on my file qml of list item custom like I do with my main.qml or is there a better way? a listitemcomponent lies in a different context, it cannot access the context property of the qml file. Got this e-mail with the subject attention! Is - is this legitimate? We discovered the series of illegal attempts on your e-mail account of different areas of the intellectual property. It's for your own safety to continue to use your account, click on the button below. Microsoft usually has a green shield on the name of the sender. This indicates that the e-mail coming from Microsoft / play the sender. How can I Report Spam, Phishing or abusive messages in Outlook.com? How can I get the old msn home page, the news is really bad! Because MSN decided to change their layout throughout the site, I'm afraid that it is not possible get the old back without MSN returning to their site at the former route, and I doubt it will happen. © 2019 eehelp.com. All Rights Reserved. 9 q. 0.866 s.